Alan Brennert, the Los Angeles-based author of "Molokai," visited Palolo Elementary last week to read from his book. Writing is such a solitary activity -- just you, the keyboard, a blank screen and, if you're lucky, some voices in your head -- that when the time comes to mix it up with the reading public, some writers have an attack of the shys. Others rise to the occasion, and a very few rather enjoy it. » Find a time when you can both relax -- bedtime, nap time, snack time, after dinner. » Get comfortable. Find a cozy spot and make sure the TV and other distractions are off. » Read the book or story yourself before you read it to your child. » If your child doesn't like a book, switch. If he or she isn't in the mood, stop reading and try again later. » Go to the library with your children regularly. Ask the librarian to recommend books and book lists. Get your children their own library cards. » Build a home collection of books. Shop at garage and book sales. Trade books with friends. » Encourage your children to look at books on their own. Let them take books to bed and read themselves to sleep, but don't ask questions. » You don't have to be a great reader, just read from the heart. » Make it fun. It's not a lesson. » Talk about the stories with your child, but don't ask questions. 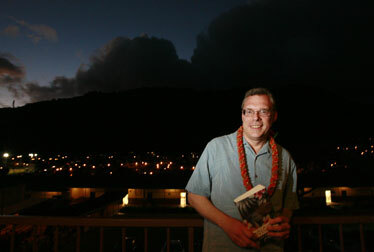 And so, when Jed Gaines of Hawaii's Read Aloud America program finished the novel "Molokai," by Los Angeles-based writer Alan Brennert, the outgoing and take-charge Gaines knew he wanted Brennert to come to Hawaii and -- well -- read aloud. "It was one of the best books I'd read in long time," explained Gaines, who thought the novel about the emotional fallout among Hansen's disease patients interned at Kalaupapa would have special resonance for Hawaii readers -- at least the potential readers his program is designed to inspire. Read Aloud, combination pep rally, game show and family reading clinic, has been embraced by many Hawaii schools. And having a real live writer there gives readers "a chance to hear, to touch, to smell the author!" crowed Gaines. "Hopefully, not smell," said Brennert, looking faintly horrified. The two were sitting in the Palolo Elementary School cafeteria, amid the bustle of Read Aloud's traveling roadshow, which includes prizes and pop quizzes. "It was a propitious time for me to come over, not that it takes much arm-twisting to get me to come to Hawaii," continued Brennert, whose credits include Emmys for writing "LA Law" episodes. "I'm doing some research on my next novel -- about picture brides -- and it was a chance to come full circle, since the last time I was here was to research 'Molokai.' And Read Aloud is such a worthwhile project." The pair also performed on Molokai itself last week, drawing several hundred curious readers and students. "Many came up and said that for the first time after reading the book, they felt sorrow about Kalaupapa," said Brennert. "The people were touched that he came to visit their community," said Gaines. Jay and Amanda Taong listened as Brennert read. The biggest reading problem in America isn't illiteracy, the two explained, it's "al-literacy," people who can read but don't. Once they're out of school, something like 6 out of 10 American adults never again read a book. For the rest of their life. "Having a program like this is marvelous and makes me wonder why it's not nationwide," said Brennert. "It's a really good experience for me to get out and read like this -- I picked two emotional scenes -- and this is much different than a book signing. You know that the folks who show up there are regular readers. It's very humbling to think we might be starting out new readers tonight." More advice to inspire young readers? "Turn off the TV! That's crucial," exclaimed Gaines. Emmy winner Brennert managed to not look faintly horrified.